There are several historical references to the Scottish Australian Mining Company building huts or cottages for the miners, first in the 1861 Inventory, then in the Sydney Mail article of 1865, where even the rental value of the buildings is revealed. Families could rent a cottage for 4s a month, or single men living together, 1s per month. It is assumed that four men would normally share, making the overall rate equal to that charged to families. Generally these buildings were two roomed cottages, measuring 12 feet by 22-24 feet long (3.65 by 6.7-7.3 metres) and were a common type throughout the Australian colonies. Josiah Holman mentions in his report of 1868 that there were upwards of 60 miners’ huts, built of slab, with either shingle or bark roofs. Since the Company maintained the buildings, even after the closure of the mine, some of these slab cottages survived into the twentieth century and can be seen in historical photographs. A group of these miners’ cottages in the south west corner of the Village were excavated in 2002 to reveal the housing and living conditions of their occupants. Timber framed slab buildings need not leave distinct traces in the ground. Most of the buildings were only defined by a small number of post-holes and slots. In some cases they may have been unrecognisable, were it not for the historical photographs. Their location can be seen on the excavation plan and compared with these photographs. 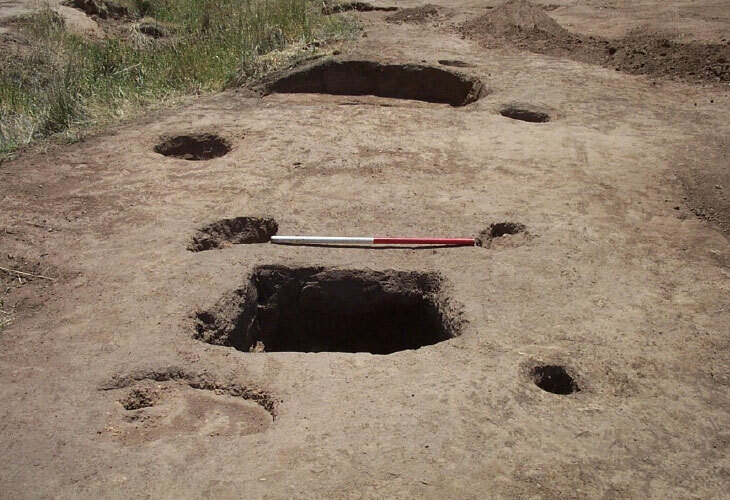 It is also true that many of the house sites in Cadia Village were found to leave few artifacts behind, except in specific locations, including fireplaces, rubbish dumps and in the cess pits for outdoor toilets. Providing sufficient artifacts had been located in these contexts, it was possible to discover details of living standards. All of the miners’ huts had small artifact assemblages indicating that the occupants were poor and lived frugally. Only two huts had any evidence of women and children (S002 and S011), the others more than likely being occupied by men alone. None of these huts possessed any evidence of literacy, while all of the other more affluent house sites at Cadia did so. The artifact assemblages reveal the lower end of the social scale at Cadia. The single men or those miners, who had left their families behind, lived a relatively frugal life. It also appears that the poorer families were illiterate and may not have been able to afford the school fees for their children, thus condemning the next generation to poverty and struggle. Some of the huts possessed evidence for work activities, mining, butchery and horse-handling, while one family possessed a sewing machine and may have used this to supplement their income. 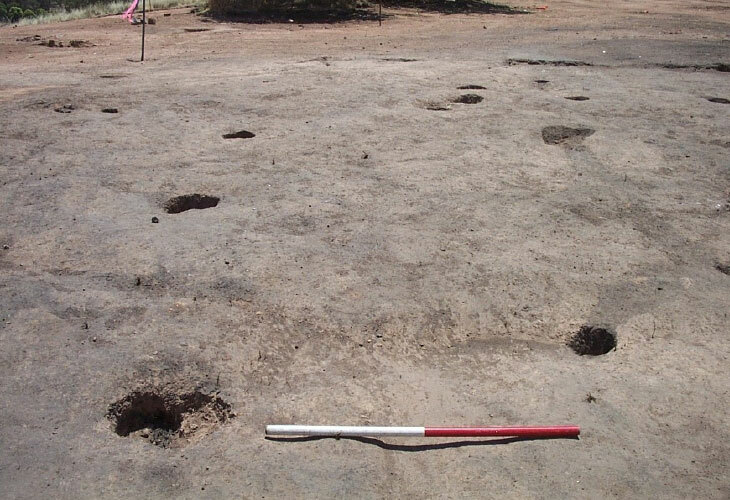 The remains of timber framed slab buildings may leave only a few traces in the ground and without historical photographs may not be recognised (scale 1 metre) (Edward Higginbotham). While the remains of the buildings may be ephemeral, the adjacent cess-pits for the outdoor toilets provide an assemblage of artifacts that reveal the living conditions of the miners (scale 1 metre) (Edward Higginbotham). 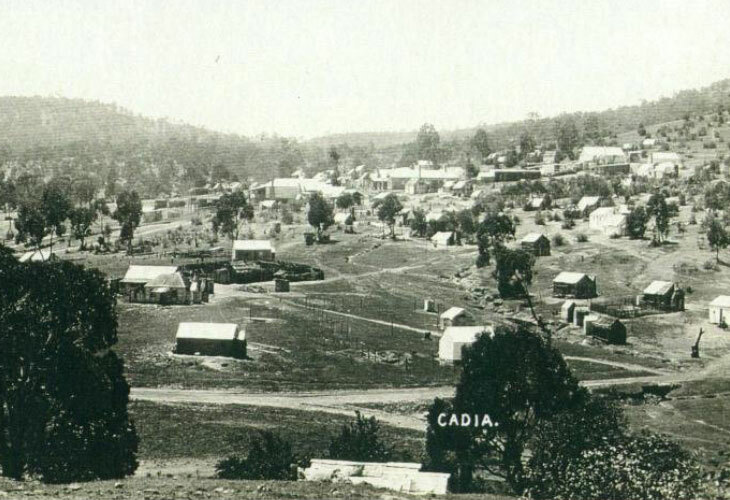 This postcard of Cadia Village, taken in 1907-1909, shows the miners’ huts in the south-west part of the village. Huts S002 and S004 can be seen on the right and can be compared with the excavation plans (French Collection).